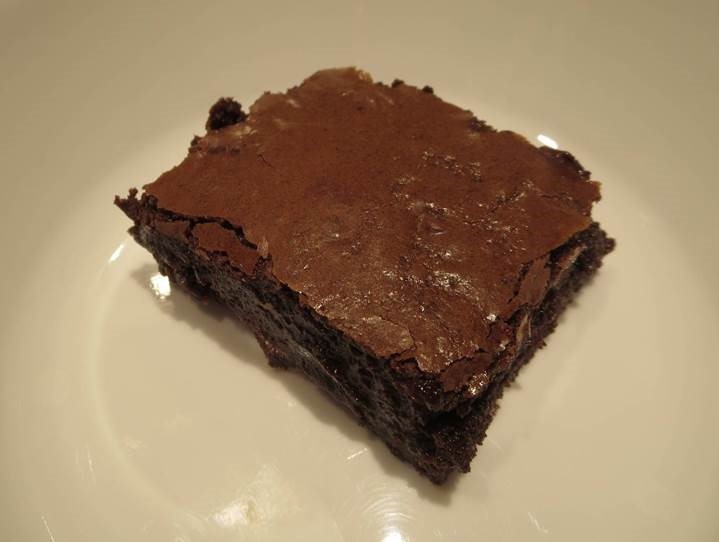 Here is a gluten free, Paleo and low carb version of the great American brownie. Use this recipe occasionally to make a special treat that is made with healthy fat and is much lower in sugar than a traditional brownie. I recommend this recipe to my clients with neurodegenerative conditions, cancer and diabetes. Benefits: When your goal is to eat a lower carb, higher fat diet, but you just want a special occasional treat this is one that I feel good about recommending to you. There is a similar recipe in my blog. This one has been modified a bit as I tend to try to improve recipes as I go. Line an 8-inch square baking pan with two pieces of foil long enough to overlap on all four sides. Lightly grease the foil using palm shortening or coconut oil. Heat about ¾ cup water in a small saucepan over medium heat. Find a glass or metal bowl that will sit on top and just inside of the pot without touching the water in the pot. Place 5 of the 8 ounces of chopped chocolate in the glass or metal bowl. Add the ghee or palm shortening. Place bowl on pot. Heat, stirring occasionally until chocolate and fat are just melted and combined. Remove from heat and let cool slightly. Put the almond flour, arrowroot starch, cocoa powder, baking soda, and salt in a small bowl and stir with a whisk to combine. Set aside. In a medium size mixing bowl combine eggs, erythritol or coconut sugar, maple syrup and vanilla. Whisk together until well combined and frothy. Add flour mixture and chocolate mixture to the egg mixture. Stir until just combined. Stir in the remaining 3 ounces of chopped chocolate. Add the optional walnuts and cocoa nibs for a crunchy texture. Pour combined ingredients into the lined pan and place in preheated oven. Bake for 23-28 minutes until the top is mostly firm set with just a little wiggle in the middle when you gently shake the pan. Remove from oven and cool. Use the foil to lift baked brownies from the pan and cut into 16 equal portions. Tip: serve with a spoonful of whipped coconut cream or top with a fine dusting of cocoa powder.